Udo Schindler lives and works as an architect in the south of Munich, Germany. He is a writer of poetry and works as well in theaters. As a musician (soprano and tenorsax, flute, accordeon, guitar, percussion and cornet) he participated internationally on several festivals and concerts of new music in Germany, Italy, Czech Republic, Roumania, Belgium, Austria and France. During the 70’s Udo played in different rock and jazz-rock bands, mainly guitar and drums, and later on saxophon and flute. He studied flute at the music high-school in Nürnberg, Germany. Beginning of the 80’s he finished his studies as an architect and since then he runs his own architectstudio. 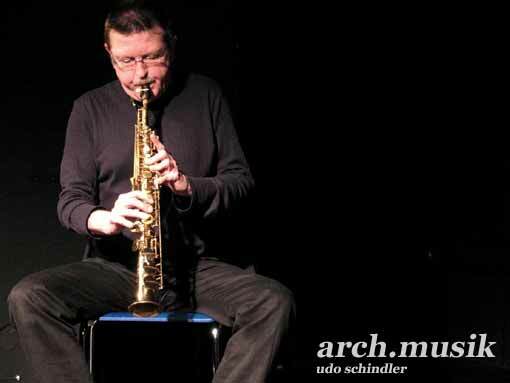 In the 90’s he founded the ARCH.ENSEMBLE ( new and improvised music ). Mainly concentrated on new sound projects for soprano, tenorsax and flute in collaboration with theater companies Udo worked in different projects as a musician, composer, actor and director. He collaborated with musicians and artists like Eddie Prevost, Sebi Tramontana, Gerry Hemingway, Jürg Solothurnmann, Stephan Richter, Gilles Zimmermann, Margarita Holzbauer just to name a few, in his career as a musician. Udo Schindler also wrote the poem ‘spring!’ ( dedicated to Ilse Aichinger ) published in the anthology: Versnetze – Das grosse Buch der neuen deutschen Lyrik, edited by Verlag Ralf Liebe and other Udo Schindler poems are published in different editions. arch.musik is his own recordlabel.